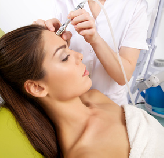 Save £40 Course of 6 facials with Signature Micro Oxygen, including cleansing, vitamin C serum and moisturizer. Indulge yourself with this absolutely incredible double deluxe treatment. Our therapists will exfoliate your skin using our Prestine microdermabrasion machine, preparing your skin for the reception of pure oxygen from our BautylLab machine, ending with a prescriptive mask and a deeply relaxing decolte and neck massage. An ultimate delight that will leave you looking like you have never seen it before.